Apple responded to requests with records pertaining to customer accounts linked to that same suspect IMEI number. Those records identified three California residents whose Apple accounts were linked to that same IMEI number. A snippet from a redacted “statement of facts” filed by prosecutors in the Narvaez case. 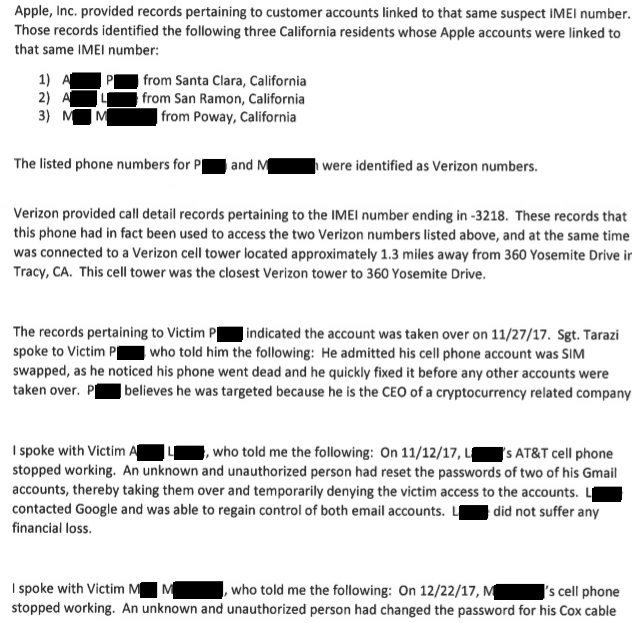 These records that this phone had in fact been used to access the two Verizon numbers listed above, and at the same time was connected to a Verizon celltower located approximately 1.3 miles away from 360 Yosemite Drive in Tracy, CA. This cell tower was the closest Verizon tower to 360 Yosemite Drive. Narvaez faces four counts of using personal identifying information without authorization; four counts of altering and damaging computer data with intent to defraud or obtain money, or other value; and grand theft of personal property of a value over nine hundred and fifty thousand dollars. He is expected to issue a plea on Sept. 26, 2018. A copy of the charges against him is here (PDF). Federal authorities also have been active in targeting SIM swappers of late. One day after Narvaez was apprehended, police in Florida arrested a 25-year-old man accused of being part of a group of about nine people that allegedly stole hundreds of thousands of dollars in virtual currencies from SIM swap victims. That case drew on collaboration with Homeland Security Investigations, which acted on a tip from a concerned mom in Michigan who overheard her son impersonating an AT&T employee and found bags of SIM cards in his room. 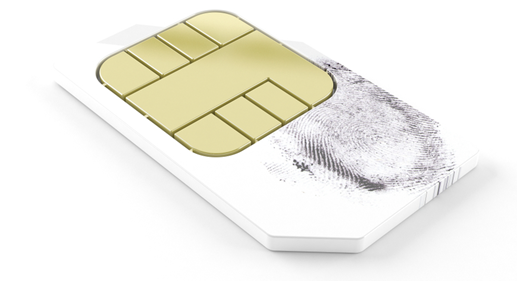 All of the major wireless companies let customers protect their accounts from SIM swapping by selecting a personal identification number (PIN) that is supposed to be required when account changes are requested in person or over the phone. But one big part of the problem is that many of these SIM swappers are working directly with retail mobile store employees who know how to bypass these protections. If you’re concerned about the threat from SIM hijacking, experts say it might be time to disconnect your mobile phone number from important accounts. We discussed options for doing just that in last week’s column, Hanging Up on Mobile in the Name of Security.